Proven solutions for better nights, from the sleep guru to sports stars including Cristiano RonaldoOne third of our lives are spent trying to sleep. Most us have disturbed, restless nights and rely on a cocktail of caffeine and sugar to drag us through the day. Yet the hours we spend in bed shape our mood, motivation and decision-making skills - defining our performance in work, at home and keeping fit.We need a new approach to sleep. One that helps us cope with our ever more demanding days and always be our personal best.Nick Littlehales is the elite sleep coach to some of the worlds leading sports stars and teams, across Premiership and international football, British Cycling and Team Sky, rugby and Olympic sports. 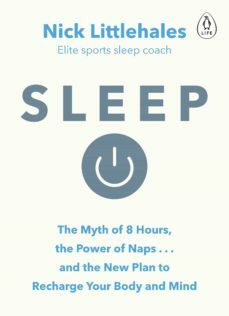 His groundbreaking practical techniques have transformed the way athletes approach sleep, unlocking higher levels of mental and physical recovery, personal best performances and ultimately a winning mindset.Now he lays bare his strategies for us all to use. From your personal sleep characteristics and cycles, to posture and bedding, he sets out achievable ways to get the highest possible quality of sleep recovery.Read Sleep, learn from the best in sport, and kickstart a more confident, successful and happier you.Nick Littlehales is the leading elite sport sleep coach to the biggest names in the sporting world, including British Cycling & Team Skys recording-breaking cyclists, top Premiership and international football teams and players, Rugby Union and Rugby League, and Olympic and Paralympic athletes from rowing, sailing, marathon, triathlon, swimming, Winter sports and athletics. He has 30 years experience in the world of sleep science, and has spent 16 years working with elite athletes. A former professional golfer and chairman of the UK Sleep Council, Nick has conducted many practical and clinical research projects into sleeping habits. His proven approach to achieving the optimum nights sleep is endorsed by leading professionals in sport and business.